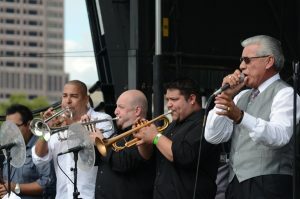 Now in its 17th year, Festival Latino returns to downtown Columbus’ Genoa Park on Saturday, August 11, and Sunday, August 12. Produced by CAPA and presented by HONDA, the free, two-day event will offer children’s activities, food, dance, and music from the heart of Latin America, including performances from Saturday night headliner Obie Bermudez and Sunday night headliner Miriam Cruz. Festival Latino sponsors include Honda (presenting sponsor), The Columbus Dispatch and Alive! (stage sponsor), the City of Columbus Department of Recreation and Parks, American Family Insurance, Chase Liquid?, AARP, DentaQuest, Molina Healthcare of Ohio, Revol Wireless, State Farm, Nationwide Insurance, Fifth Third Bank, Adecco, Brickman Group, Columbia Gas of Ohio, F & K Iglesia de Cristo, Kroger, Liberty Mutual Insurance, Mount Carmel Health System, State Auto, Columbus Museum of Art, The Ohio State University Center for Latin-American Studies, VSP, and IDT Telecom. Additional support is provided by El Sol de Ohio, La Raza de Ohio, KidsLinked.com, Telemundo Columbus, Azteca Columbus, and Bounce 23-TV. DJ Cale caters to Caribbean and Latin American tastes, spinning salsa, merengue, bachata, reggaeton, Latin pop, Latin dance, house, and a touch of American Top 40 music. Richard Bastar Jr., known as B. A-Star, is a former member of the group Tercera Generation (or 3G) with his brothers, boasting the fact that they are the third generation of Bastar in the music industry. Now pursuing a solo project, B. A-Star has created a new urban dance sound. A renowned salsa singer and bandleader from Puerto Rico, Tony Vega earned a Gold Record for his album Lo Mio es Amor (My Thing is Love) which included the songs “Ella” (“She”) and the English language track “Love is Forever.” He also won a Platinum Record for his album Uno Mismo (Yourself). Puerto Rican salsa sensation Johnny Rivera boasts ten albums in his more than 30 years as a Latin singer. His contemporary style combines his exquisite romantic delivery with swinging and aggressive arrangements, earning him four appearances in the top of Billboard’s Tropical/Salsa chart. R&B/salsa singer, composer, and Platinum recording artist Obie Bermudez includes a social message in his music, which earned him a 2005 Latin Grammy for Best Male Pop Vocal Album for Todo el Año (All Year Long). 3:30 pm – Dayton-area dance company Grupo Caribe will hold a demonstration of the dances of Puerto Rico. 1:45-2:30 pm – Catch a showcase and celebration of modern Latino style in the Latin Fashion Show. Local adults and children will model a progression of fashion from traditional Latin clothing through the modern designs of today in a live, runway show. Makeup services provided by Mary Kay Cosmetics. Hair services provided by Sol y Luna. 5:15 pm –Perlas Del Caribe, a diverse dance group from Cleveland, will demonstrate merengue, the official dance of the Dominican Republic, and salsa, which originates from the Cuban Son style of dancing. 12:00 pm – Watch a taekwondo exhibition given by instructor Enrique Infante and a few intermediate students from the Columbus-based Centro Esperanza Latina and Infante Taekwondo School. 2:00-3:00 pm – Local Latin fusion artist Enrique Infante will host an interactive hour for children in which they can sing along with traditional Hispanic songs, listen to short stories about Latin American culture, and join a drum circle. 3:30-4:00 pm – So cold, it’s hot! Join COSI for their live, liquid oxygen show and learn more about one of the coldest liquids on earth and the amazing things it can do. 4:00-5:00 pm – Local Latin fusion artist Enrique Infante will host an interactive hour for children in which they can sing along with traditional Hispanic songs, listen to short stories about Latin American culture, and join a drum circle. COSI’s Science Spot – This traveling exhibition gives families the opportunity to play, explore, and learn about science together with hands-on kiosks featuring activities to help children learn about basic science concepts, including force and motion, structures, magnetism, gadgets, and more. Mexican Flowers – Big, beautiful flowers are used in Mexico to decorate on days of celebration. Join the members of Organización de Damas Latinas as they help children construct these colorful creations. Balloon Twisters – Balloon artists from Creative Distinctions will create fun balloon designs for children from 2-4pm daily. Abraham Cordova – Winner of the 2002 Scholastic Art and Writing American Visions Award and a 2006 graduate of the Columbus College of Art and Design, Cordova specializes in portraits done with watercolors, charcoal, and colored pencils. Vrindarani Muñoz – With a degree in art design and communication, Munoz’s art pieces have been exhibited in many galleries and festivals. She enjoys portraits of human figures in faces created with acrylic, oil, and watercolor paints. Carlos Roa – Influenced by native roots and inspired by other cultures, painter Carlos Roa takes colors, designs, and dream influences and applies them to his work in an effort to visually express things in a diversified way. His main goal is to inspire and unify his audience through his unique style. Guests are encouraged to bring blankets for lawn seating. Chairs, tents, pets, handbills, solicitation or unauthorized sales, coolers, bicycles, and skateboards are not permitted. Festival Latino is a rain or shine event. There is no rain location. Paid parking for the public and handicapped is available at COSI (333 W. Broad St.), Veterans Memorial (300 W. Broad St.), and nearby surface lots. Bicycle racks will be located at the corner of Broad and Washington. All acts are subject to change without notice.